10 things to do for free in Berlin, this week!! The EastSeven Berlin hostel made an amazing top 10 of cool events and sights in Berlin, 100% free of charge !! This is street theater at his best! Expect the unexpected! There will be acrobatic, live music, clowns and a lot of more different kinds of performances! on Mondays and on Wednesdays we cook for our guests. This is the opportunity for all travelers on a budget to meet up with other travelers and filling their bellies ! We meet at the hostel kitchen at 7pm! 3. Sunday is fleamarket day in Berlin! Sunday is fleamarket day. Close to the hostel (500 m)you find the Arkonaplatz Fleamarket and the famous Mauerpark fleamarket. You don´t want to buy something – no problem you first of all go there to see all kind of urban subjects with hangover and even sober ones. 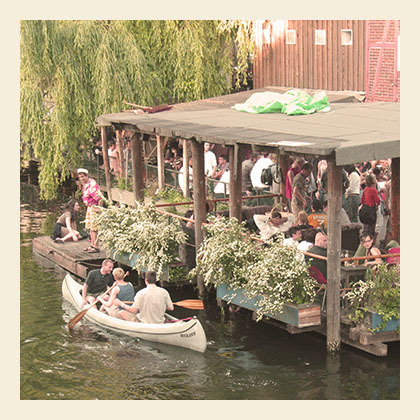 Berliners go there – you should as well. When visiting Berlin, you should visit some historical sites aswell. for instance the Sachsenhausen concentration camp. It’ s not going to be a fun trip, but you will learn so much more about the terrible second world war and its victims. On a late Saturday morning you should go to where the locals go – the farmer´s market on Kollwitzplatz – 200 Meters from EastSeven. Fresh organic vegetables, varieties of sausages and a lot more of savoir vivre. By your food of the season there, go back to the hostel and prepare it in our fancy self catering kitchen. this 30m high tower was built in 1877 as the local water reservoir. Once used by the Nazis as a prison, today the round brick Wasserturm has been converted into trendy apartments. re-opened in 1999 after the government and most of the ministries moved from Bonn to Berlin. British architect Lord Norman Foster redesigned this place, complete with a huge glass dome with public access, so you can watch the politicians at work.Admission is free; advance registration required. is one component of the memorial site ensemble at Bernauer Strasse. The ensemble consists of the Berlin Wall Memorial, the Chapel of Reconciliation and Documentation Center. The Documentation Center is officiated by the Verein Berliner Mauer – Gedenkstätte und Dokumentationszentrum, which is supported by an advisory council and bears responsibility for the project content. The Documentation Center on the history of the Berlin Wall provides historical information and educates the public. It makes information and in-depth programs available to the interested public. Beginning with the historical, political events that occurred at Bernauer Strasse, an area situated at the border between East and West and hence a focal point of German postwar history, the center researches and presents the history of the division of Germany. The Documentation Center opened on November 9, 1999, the 10th anniversary of the fall of the Wall, with a workshop exhibition titled “Grenzblicke. A new exhibition titled “Berlin, August 13, 1961” has been on display since August 13, 2001. The exhibition, presented in both English and German, was designed by the Berlin company gewerk. The Documentation Center is housed in a section of the Evangelical Reconciliation Parish. The rooms, provided rent-free, are to be used for documentation and for an exhibition.